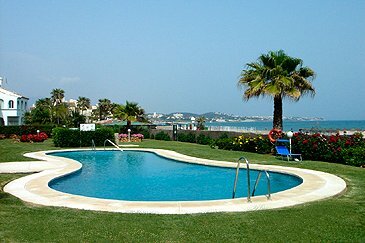 On the edge of one of the finest beaches on the Costa del Sol and 5 minutes stroll into the centre of La Cala de Mijas. Places to visit include: Granada, Marbella, Fuengirola, Malaga, Benalmadena, Mijas, Mijas Hippodrome, Seville, Torremolinos, Puerto Banus, Ronda, Sierra Nevada, Tivoli World and the golden beaches of the Costa del Sol. 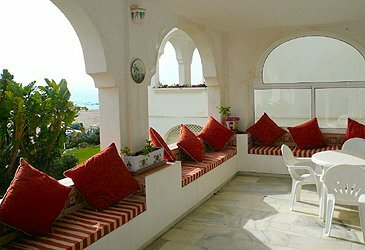 The huge terrace overlooks the gardens and La Cala de Mijas Beach. The apartment at Santa Maria is beautifully furnished. There are two large bedrooms with fitted wardrobes, one of the bedrooms has full en suite facilities. There is also a second family bathroom with shower. Both bedrooms open to the terrace and have unobstructed views over the tropical gardens below. Their are views to the beach and to the sea. 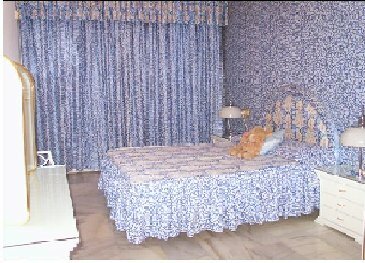 The bedrooms are very spacious allowing for the addition of an extra bed in each, if required. The lounge area is very comfortably furnished and very spacious. It will accommodate up to six persons in complete comfort. There is satellite television, DVD player and HI Fi system in the lounge. Via sliding windows, the lounge opens onto a very spacious patio. This also overlooks the beach and out to sea. The patio is also well furnished and situated for "al fresco dining". The modern kitchen is completely equipped to make your stay comfortable, with fridge freezer, microwave, washing machine, tumble dryer, ceramic hobs, electric oven and dishwsher. The extract system vents directly to the outside. The dining-room area has a large table, sufficient for seating 6 comfortably. The dining area is finished off with tables, lamps and modern attributes completing a sophisticated, and relaxing atmosphere. Close to the apartment there are all of the facilities you will need including the main Post Office, supermarket, restaurants and bars. 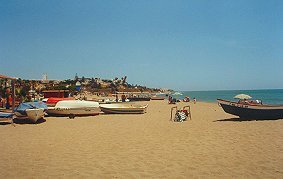 There are two small beach bars and some larger beach bars just a few minutes walk away on the sand. Nearby is the best bakery/coffee bar in La Cala de Mijas. You will need to watch your weight here !! 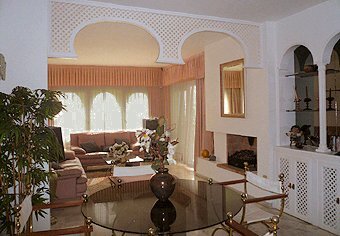 Entertainment is excellent in La Cala area with something for everyone nearby. This is "Golf Valley" but in addition to golf there are a number of riding schools, splash parks and of course the Hippodrome which is the horse racing centre of the Costa del Sol. Also at the Hippodrome (Hipodromo) during the summer months a series of top artists give concerts attracting more than 20,000 people. Artists such as Elton John, Bryan Adams and Rod Stewart have performed here. This property is very popular, please book early to avoid disappointment.